This very stylishly decorated holiday home is located in the little village of Westerland between Amstel Lake and the Wadden Sea. The accommodation is situated at the edge of a campground, where you can use all the facilities. 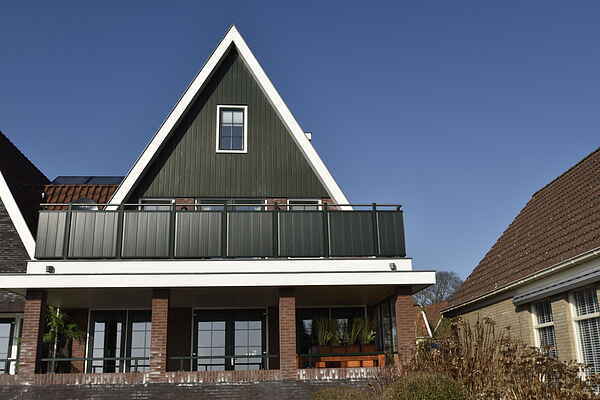 From the home's roof terrace you can enjoy the view of the campground and Amstel Lake. The campground has its own cafe where a variety of nice activities are organised in the summer. From the campground you can walk along a shell path to a little beach on the lake. On the beach you will also find a beach tent, which is a nice place to enjoy a drink in the summer. The Wadden Sea is about 500 metres away. You can go on wonderful hikes and bike rides here over the long dike. If you feel like a day at the beach on the North Sea you can head to Julianadorp or Callantsoog, 15 minutes away. The campground has its own playground as well as a panna court, which is a great spot for the kids to play football. This is a very comfortable holiday home where you can enjoy some peace and quiet but also join in at the campground when you feel like socialising.